This is a shorter version of our standard contract for a self-employed consultant to present to clients. It is intended for situations where your work or your clients make it difficult or inappropriate to propose a comprehensive agreement. It is suitable for any type of consultancy work. We have two agreements for an individual consultant: a comprehensive version that contains detailed provisions and this shorter one drawn for situations where the client may not accept a lengthy document, where the services performed are straightforward, or where there is a high degree of trust. 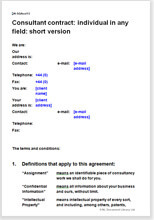 This agreement is suitable for a single, fully described work assignment. This is likely to be a standard service, such as employee screening or advising on tax planning that is advertised on your website or in marketing brochure. The document can be used in any field of industry, for any type of advisory work. We separate the legal terms from the schedule of work to be performed so that you can edit the latter for each new client or each new project without having to edit the entire contract. Primarily, it establishes your employment status as self-employed. Of course, it also protects you in law, helping to ensure that you are paid for the work you carry out. There are over 1,600 words of helpful and informative drafting notes to help you edit the contract perfectly for your requirements.